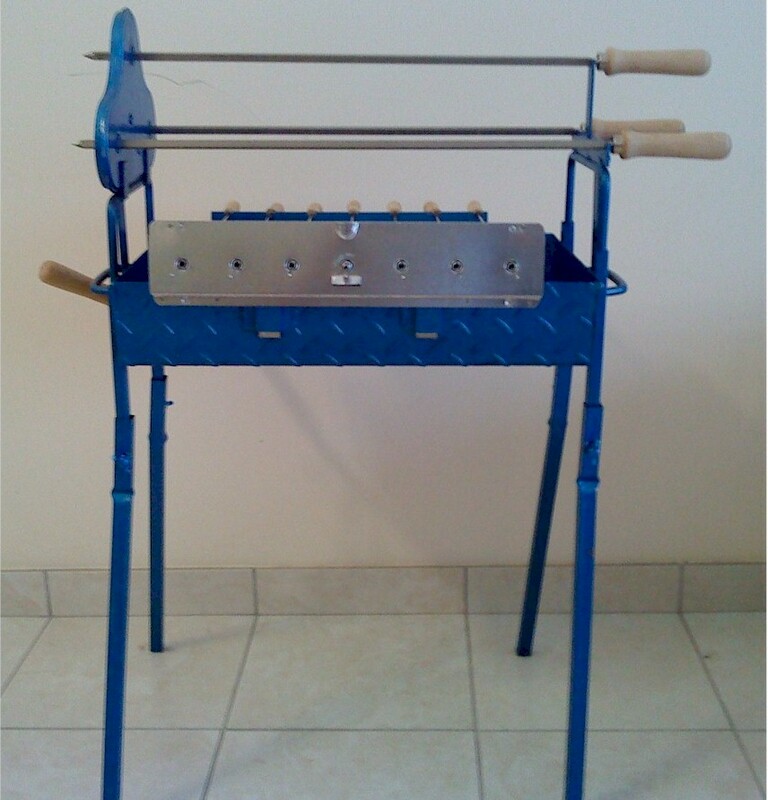 This s/s grill is suitable for the Small Cyprus Charcoal Grill and for those who still want to cook old style BBQ. Its made out of stainless steel 4mm wire net and fits into large spits mechanisms. Moves up and down along with the mechanisms of the grill. It does not rotate. 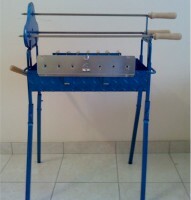 Charcoal grill 40cm width with chain rotating mechanism. Comes with 6 s/s spits, 1 rotating grill and a battery motor to rotate the spits . Ideal for fire places to cook pieces of meat (pork, lamb, chicken) sausages. Just put the meat on the spits and let your meal cook “no hands” needed to turn those kebabs anymore. This s/s grill is suitable for the Modern Charcoal Grill and for those who still want to cook old style BBQ. Its made out of stainless steel 4mm wire net and fits into large spits mechanisms. Moves up and down along with the mechanisms of the grill. It does not rotate. Dimensions 65cmX 35cm. 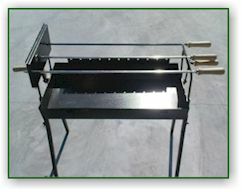 This s/s grill is suitable for the Cyprus Charcoal Grill and for those who still want to cook old style BBQ. Its made out of stainless steel 4mm wire net and fits into large spits mechanisms. Moves up and down along with the mechanisms of the grill. It does not rotate. Dimensions 65cmX 26cm. Stainless steel meat retaining forks fit an 8mm square spit rod. Comes into pair (2) of forks. The Ash Can Cleaner puts an end to sweeping out the grate with a dustpan and brush and emptying the ash pan without spilling it! Simply attach to any vacuum cleaner and you can vacuum ash straight from the grate and ash pan with no mess! Suitable for all open fires, wood and coal burning stoves. Ash and debris is collected in the container and is filtered (one filter supplied) to protect your vacuum cleaner from damage. To empty, simply unclip the lid (no bags required!). 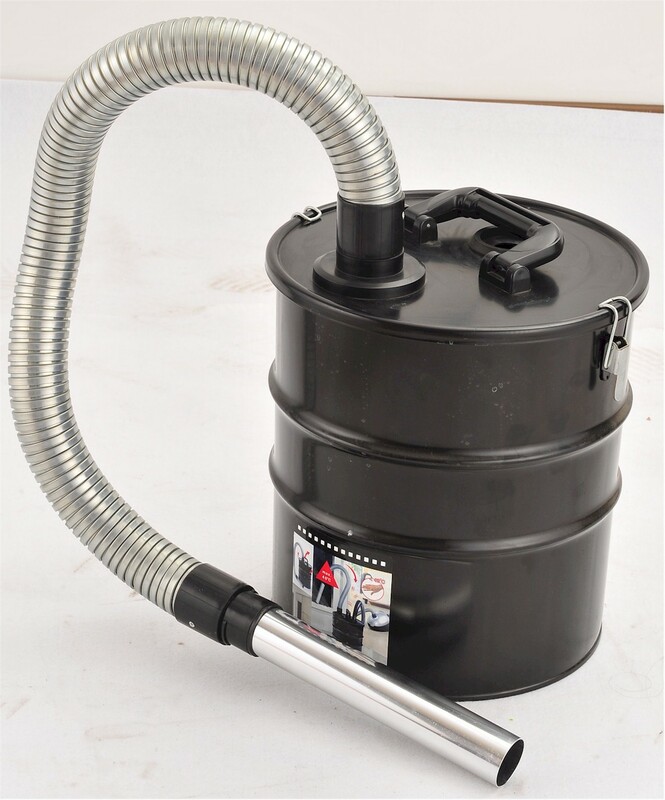 Also suitable for vacuuming broken glass, nails, nuts and bolts etc in garages and workshops. This type of Grill is suitable for professionals. 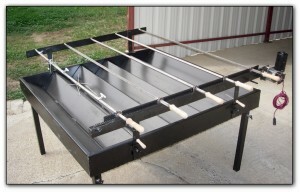 With this extra large grill ( 125cm x 130cm ) you can cook up to 20 chicken or 5 small pigs or lambs. You can also cook pieces of meat. 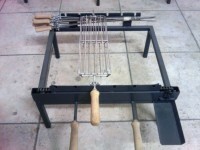 Comes with 5 s/s spits, 26 s/s forks for holding chicken and other big size portions of meat from spinnig on the skews. It has two speed electric motor and 3 positions for cooking.Weights about 200Kg. 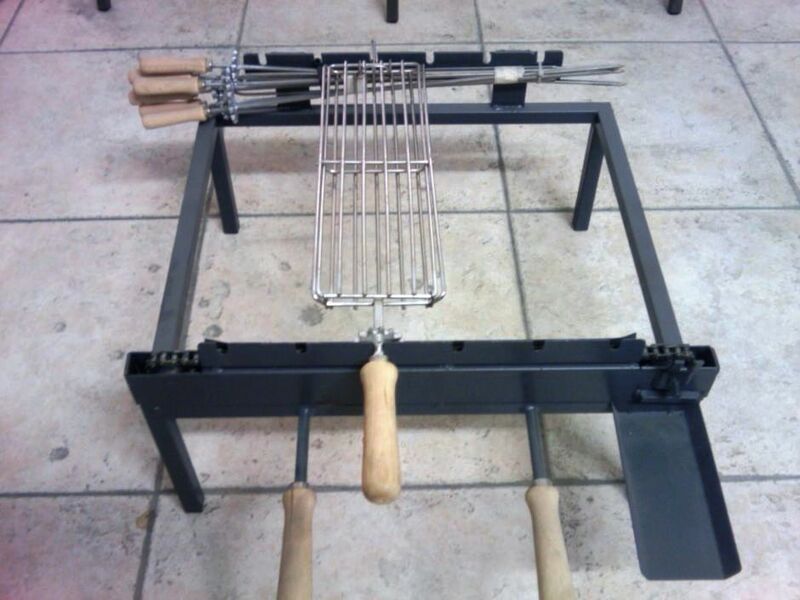 This modern Cypriot charcoal grill is wider than the typical model and has all three rotating slots on the same level.It has also an automatic mechanism to adjust the leverage of the spits while cooking. Comes with three large s/s spits, 11 small s/s spits four metal legs and Grill battery motor. Ideal for pieces of meat (pork, lamb, chicken) sausages. The charcoal grill can be combined with rotating grills 1 and 2 and give you the ability to cook almost everything.Just put the meat on the spits and let your meal cook while enjoing your company. This type of Cyprus Charcoal Grill is 20cm smaller than the Original “foukou” and has 7 small souvlaki spits. All spits are s/s and there is also available rotating grill for cooking what ever you like.With this type of Charcoal Grill you will be able to cook the same food as the original size grills but in fewer amounts. Comes with 3 large (61cm) s/s spits, 7 small s/s spits, 4 metal legs and a battery motor. Enjoy your BBQ with a good glass of Wine! This electric motor is suitable for spinning all types of rotating mechanisms. It is very powerful, capable of rotating more than 15Kg of meat.Working with both 240V/12V multiple speeds and reverse. Copyright 2011 © The Cyprus Grills Ltd.. All rights reserved. Powered by WordPress and the Antiaris theme.